Almost a year ago a Ruby-Crowned Kinglet appeared in our backyard. He was a very welcome visitor and I wanted to sketch him. But as with all Ruby-Crowned or Golden-Crowned Kinglets I've seen he just wouldn't sit still long enough for me to do so. I wrote a post on this in late February of 2008. When I've seen kinglets close up, i.e. so close I don't need my binoculars, they always looked like ping-pong balls with wings. Perfectly round. But also constantly in motion. So I decided that I really shouldn't call them ping-pong balls. That perfect sphericality implies solidity and stasis. That certainly doesn't describe kinglets. Then 'Flying Hiccup' popped into my head. That sounded right. Kinglets are constantly exploding with movement, just like an uncontrollable hiccup. The two photos above show a Ruby-Crowned Kinglet from this winter. I'm not sure if it's the same one that was here last year but it is possible. My guess is that it's even probable, but that's just an uneducated guess. What is striking about the photos is how they show that ping-pong ball sphericality. I've been trying to sketch this kinglet from life over the last few weeks. I've not been successful. But one of the first things that has struck me is the sleek profile of his upper torso. The head moves gradually and sleekly into the mantle and back, much like a Red-Eyed Vireo. This was a great surprise. I expected Roly-Poly. I found Sleek! The sketch above shows three attempts to capture that sleekness (along with two juncos, who also didn't sit still for long). I think I may have noticed this sleekness due to my current reading: 'Lars Jonsson's Birds.' This book is incredible! 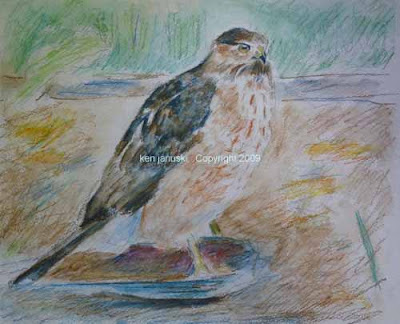 Some people have said that Jonsson is the best living bird artist and he has to be one of the best. He does a spectacular job of melding detailed observation with artistic rendering and sensibility. I may write more about him at another time and have published a review of this book at Amazon. 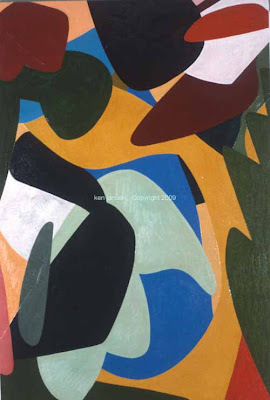 Jonsson emphasizes close observation from life, both in his writing and in his art. And he says he just draws what he sees. 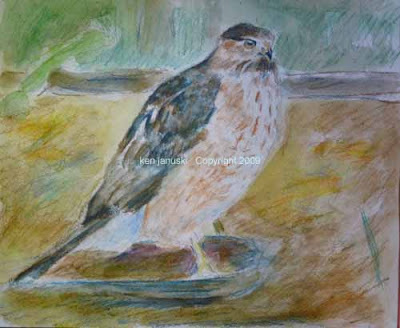 If the bird leaves before he finishes what he was drawing he doesn't rely on past knowledge to finish off the sketch. He just stops drawing, making sure that anything he puts down in a sketch is just what he actually saw. Eric Ennion's advice is similar but stronger: "STOP", he says when the bird has moved or flown. Don't use your visual memory of it, at least not when you're making sketches. Only use sketches for real, observed portrayal. 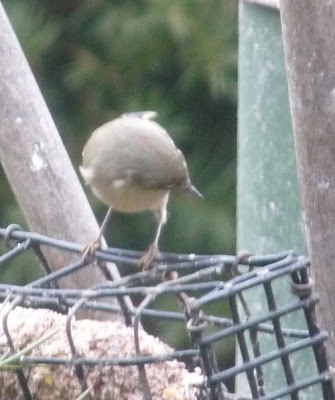 In trying that method today I of course didn't get far before the kinglet flew. In fact I wrote this post a week ago and have held off on publishing it in the hopes of including a better sketch. 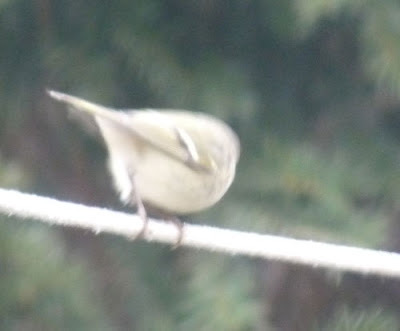 No such luck though the kinglet has been here for a few minutes most days. The one thing I kept seeing was the sleek line from head to back. That is what I have tried to emphasize in the sketch above. It's also what I look for each time I see him. One day I'll finally do a decent sketch. 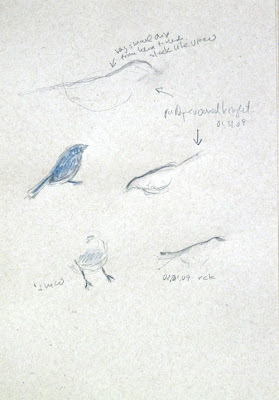 I first wrote about sketching kinglets even before my post of a year ago. I think that it's been at least 18 months now that I've talked about trying to sketch them. Like mastering watercolor it has been a difficult task. But it is a worthy one and one I'm confident I'll succeed at eventually. In the meantime the work of Lars Jonsson has been a great example of the possibility of accomplishing such goals. The trouble with working with hybrids, or multipurpose tools, is that they can be confusing and sometimes not as good as the original, unadulterated tool. Today's case was watercolor pencils and waterbrushes. I used a larger piece of watercolor paper than usual, 11x14. I also worked from a photo because there just wasn't much activity outside at the feeders. Though the drawing proceeded fairly well I found myself using the pencils in such a way as to use only one color in each area. So the front of the hawk was just white paper with reddish markings. I just used one color in each area. I also was actually doing more of a drawing that I thought I'd change later into a painting. But I don't like working this way and the world doesn't look this way. Colors merge; they overlap; they intermingle. They also intermingle in good paintings and rarely just stay in one area. And drawings don't magically transform into paintings. I also found that though I'd been happy with using the waterbrushes on smaller works they didn't really seem to hold enough water for this larger scale work. No sooner had I put down the brush than it was out of water. 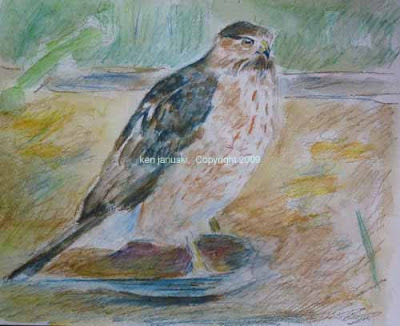 The first version of this watercolor, above, shows the small color washes from the waterbrushes. Their spotty quality bothered me but I was happy that it forced me to keep much of the white of the paper. When I looked at the earliest version of painting at top it just didn't look coloristically unified. I decided that I needed to abandon the small waterbrushes and pick up my normal watercolor brushes and paints. I mainly just used plain water to pull watercolor out of the previous watercolor pencil marks but spread them out into larger color areas. This seemed to improve things slightly. But when I stepped back and looked at it the painting still seemed disorganized, a somewhat confused hybrid of watercolor pencil, waterbrush, watercolor and watercolor brush. It also seemed a half drawing/half painting, half-sketch/half watercolor. So I went a little bit further in this last version and used broad watercolor washes to wipe out the detail in some areas and try to unify the painting coloristically. Of course in doing so I've lost much of the vibrancy of the white paper, most of which only remains isolated in the hawk itself. All in all the problem is in me, not my tools. The tools are fine; I'm just having a hard time making them do what I want. If I'd had a more unified vision of what I was about this sketch/painting probably would have proceeded better. But just as many birding ventures find few birds, many attempts at art, don't come out quite as well as you'd hoped. This was a quick work, two hours at most. I hope that I've learned something for the future. After I posted this I realized something more. Though the work took two hours at most I should have used more time to just think about it, especially the surrounding environment of the hawk. I'm used to just starting and improvising as I go, especially when it comes to background. This seems to be a fairly common problem in bird art. Watercolor, even as far as I can tell watercolor done with watercolor pencils and waterbrushes, really is better with some advance planning. That's been a very hard lesson for me to learn. I have been thinking about how comfortable I am working in charcoal. But I've used it for years and that's why. Watercolor, whether pure or hybrid is still very new. It has the excitement of the new, tempered by the frustration of the new. But the most important thing is to keep working. As John Bogle says in his new book 'Enough': you must always press on. That's the path to accomplishment. I've done little artwork recently partially due to the holiday season but also due to the number of bird counts that I take part in during January. Last week was the Christmas Bird Count at the Schuylkill Center For Environmental Education in Philadelphia, PA. Tomorrow is the Philadelphia Mid-Winter Bird Census organized by Keith Russell. Both take up a good portion of the day, especially the Mid-winter census. I take part in them both because I like to bird but also because it's fascinating finding out what birds live in an area in the winter. Almost all of the migrants are gone and just the hardy winter residents remain. Most people would be shocked to see how many different species of birds remain around in the winter time. Keith's reports on Philadelphia show that 92 species were seen last year. The results can be seen in this PDF. While many people are shocked to see even Robins in winter in the northern U.S., especially in the cities, the Mid-Winter Bird Census found almost 100 last year in a large northern city! That continues to amaze me. So I've been busy and will be busy birding, perhaps not madly, but certainly a lot. So you need to 'draw like mad' probably without thinking in order to come to a type of knowledge that understands the essentials of a bird. It is a weird combination of thoughtlessness and the very deepest consciousness. That coupled with an 'overriding sense of pictorial rightness' leads to great bird art.